The UN Security Council has once again expressed its commitment to achieving “a just, lasting, and mutually acceptable political solution” to the situation in Western Sahara. Last week, the Council voted unanimously to approve a one-year renewal of the mandate of the United Nations’ peacekeeping mission in the Western Sahara, known as MINURSO. 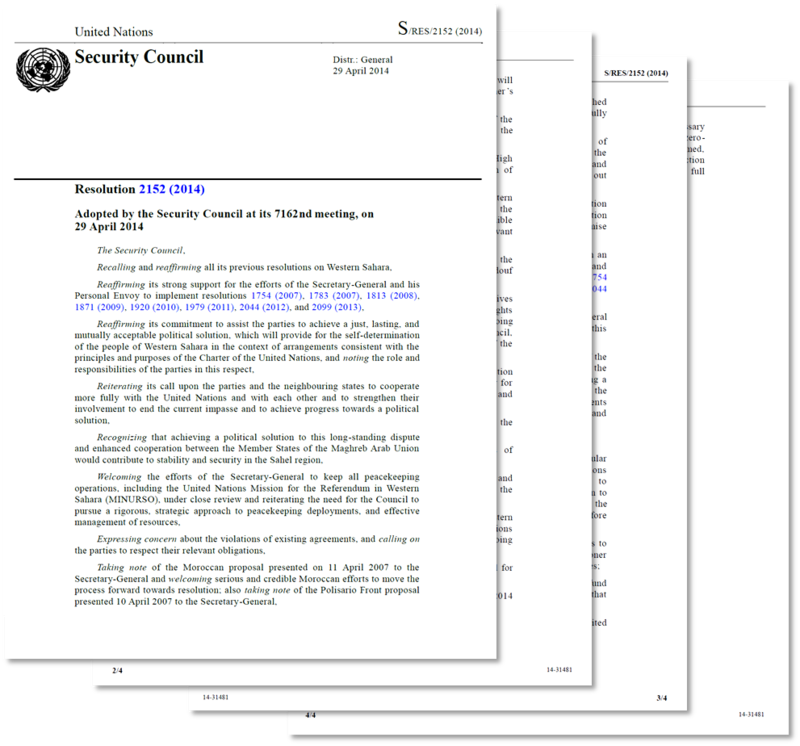 The Security Council’s call for political compromise comes right at the top of the resolution, as it has nearly every year since 2004, when the UN acknowledged that a referendum would be unworkable. Resolution 2152 calls upon the parties to demonstrate “further political will towards a solution” on Western Sahara and welcomes “the commitment of the parties to continue the negotiations process.” What negotiations process you might ask? There has not been a single round of formal negotiations between Morocco and the Polisario Front since 2008, when Peter van Walsum, the former Personal Envoy of the Secretary-General for Western Sahara, issued his bracingly honest report calling for the next round of formal talks to focus on the only real solution: one based on autonomy under Moroccan sovereignty. And neither nine rounds of informal talks from 2008-2012 nor the “shuttle diplomacy” conducted since then by UN Personal Envoy Christopher Ross have advanced a resolution of the conflict. So what will this year bring? If it’s anything like the past ten, the Polisario will continue to ignore Security Council calls for negotiating a mutually acceptable political solution. The Polisario Front has rejected every proposal that does not follow its own mistaken claim that independence is the only expression of self‐determination for the territory. The Polisario will also likely continue to refuse to negotiate on the basis of Morocco’s compromise autonomy plan, presented in 2007 and widely accepted by the US and much of the international community as a “serious, realistic, and credible” proposal that provides real autonomy for the Western Sahara. Moreover, they will continue to threaten war as they did just this past weekend – threatening that “a return to arms in 2015 is inevitable.” I think we can all agree that this is the last thing the region needs as it attempts to tackle urgent security and development challenges. But wishing for that won’t help. Instead, the United Nations, the Group of Friends, and the United States need to recognize at long last that the Polisario is not a willing negotiator and put pressure on it to compromise. Whether we consider the nearly 40 years since the start of the conflict – the amount of time that refugees have been languishing in Polisario-run camps — the 23 years since the establishment of a ceasefire, the ten years since the abandonment of the referendum process, or the six years since Van Walsum’s report noted that an independent Western Sahara is unrealistic, we must come to a firm conclusion that this conflict has gone on far too long. Something’s gotta give. Here’s to 2014 marking a breakthrough in the impasse.